Choose from a selection of the hottest cars, drive at break neck speeds, RAM your opponents into parked cars and watch them explode in a ball of flames! 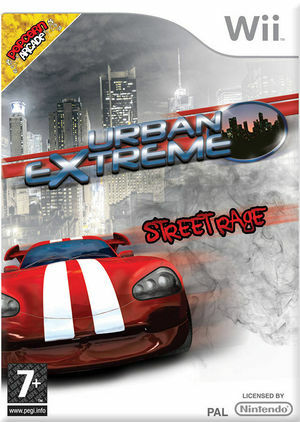 Urban Extreme: Street Rage utilizes the Wii Remote to put you right behind the wheel of some awesome super cars and ensures that you feel every bump, nudge, crash and crunch. Tilt the Wii Remote around bends and watch out for over or under steering. Get a corner wrong, or crash into another vehicle and you'll hear and feel everything as if your hands were on the wheel itself. Race against the craziest drivers from each town and earn prize money. Then use your cash to unlock extra vehicles, each with their own handling characteristics. All of this amounts to a long and entertaining experience that keeps you coming back for more and more. The graph below charts the compatibility with Urban Extreme: Street Rage since Dolphin's 2.0 release, listing revisions only where a compatibility change occurred. This page was last edited on 13 January 2018, at 08:43.